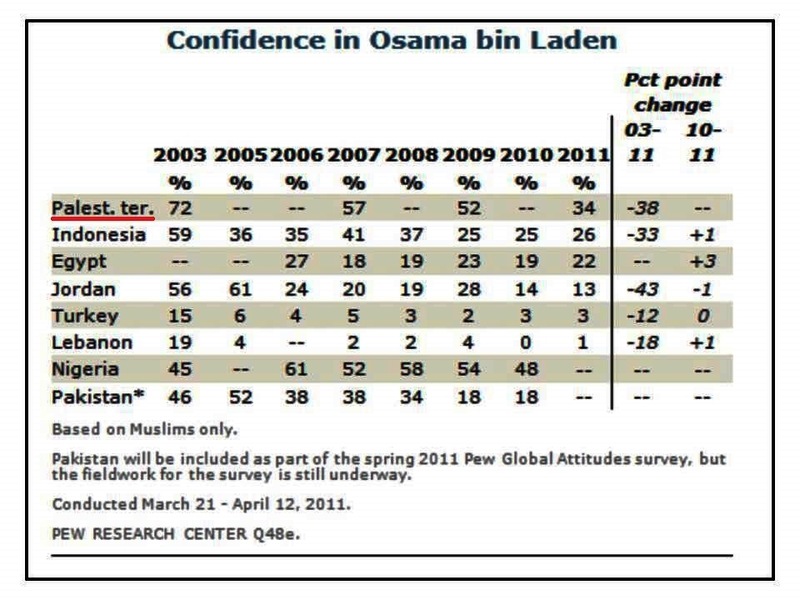 How would Qantara like an article arguing that it is ‘no wonder some may see a Muslim person or site as an extension of the Saudi/Iranian/ISIS policy they detest’? When I saw that this post was authored by regular Qantara contributor Emran Feroz, I remembered that I had come across this name before. Indeed, it turns out that Feroz – who describes himself on his Twitter profile as an Austro-Afghan journalist and blogger – is an ardent admirer of Max Blumenthal. It is thus hardly a surprise that he happily announced his satisfaction that his Qantara post “made many Zionists angry.” Perhaps Feroz hopes to have as many Jew-hating fans as Blumenthal? “Some German politicians have tried to muzzle debate about Israel by denouncing its critics as ‘anti-Semites.’ The American journalist Max Blumenthal — author of Goliath: Life and Loathing in Greater Israel — faced such a smear on a recent speaking tour in Germany. 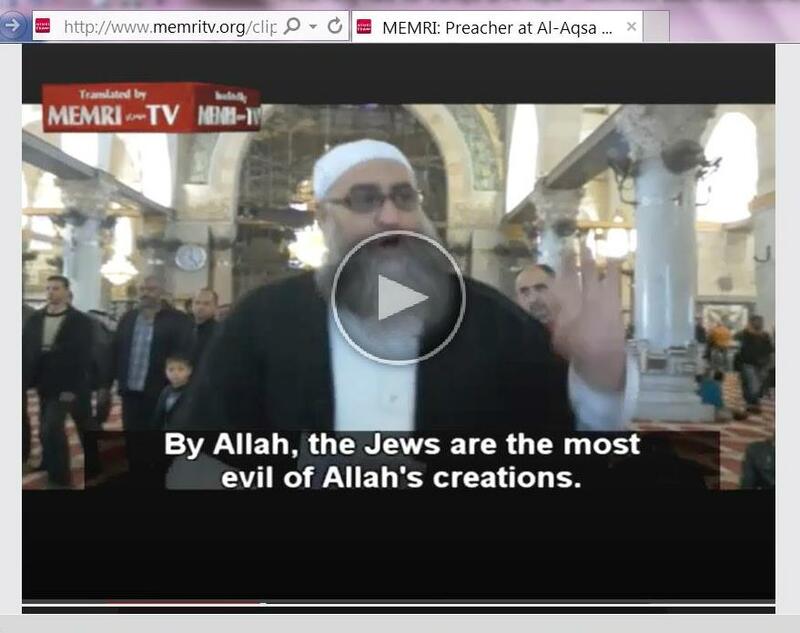 It is of course very regrettable that a government-funded site intended to serve as Germany’s “bridge” to the Islamic world employs a regular contributor who downplays antisemitism, admires professional anti-Israel activists and has started to publish on the sites that cater to these activists. 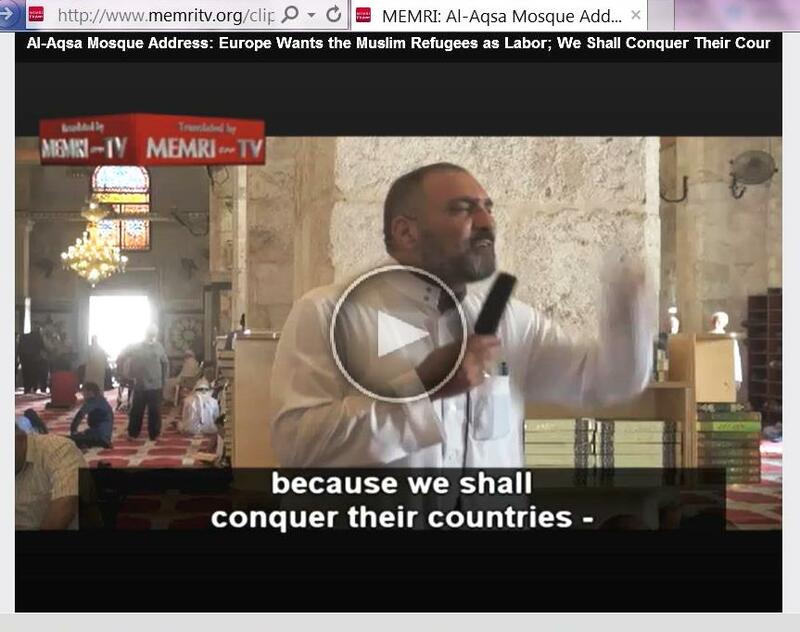 In addition to his Electronic Intifada contribution, Feroz has also recently published a post at the hate site Mondoweiss that has been shown to promote antisemitic material. 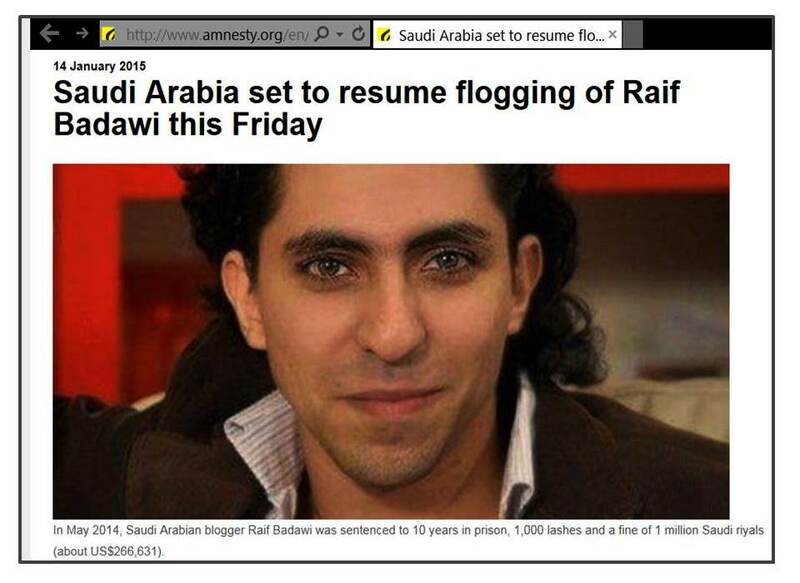 But it would be wrong to think that this affects only the coverage of Israel. As I have often argued, anti-Israel attitudes tend to come as a package deal, combined with anti-American and generally anti-Western resentments and a host of pseudo-progressive poses. It is thus hardly surprising that Feroz responded to a complaint of the notorious Electronic Intifada contributor Rania Khalek about the German media coverage of Blumenthal’s “toiletgate” with his own complaint about how apparently unpleasant it is to be a writer in Germany. Naturally, Max Blumenthal was sympathetic to Feroz’s plight. In addition to the already mentioned article promoting BDS and the elimination of Israel as a Jewish state, another of Feroz’s recent contributions to Qantara illustrates his eagerness to promote material popular among the anti-Israel crowd. 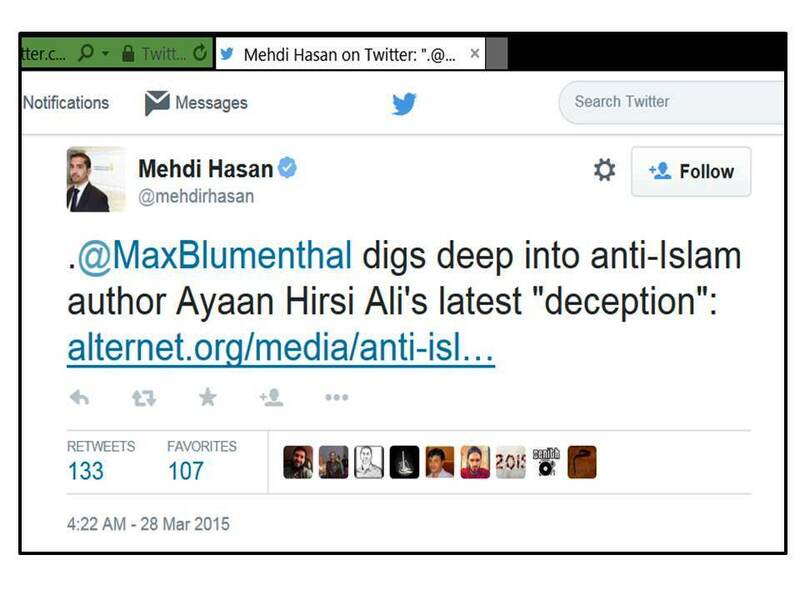 In late March, Max Blumenthal published a vicious attack on Ayaan Hirsi Ali, and sure enough, two months later, Qantara published an article by Feroz that faithfully recycled many of Blumenthal’s smears. It is somewhat heartening to see that a Qantara reader who claims to be Muslim took the trouble to post a response in defense of Hirsi Ali. But among the anti-Israel activists Feroz admires and promotes, voices that are critical of Islam and urge wide-ranging reforms are generally viewed with hostility – which is only natural when leading activists openly favor Islamist and jihadist groups such as Hamas and Hezbollah. 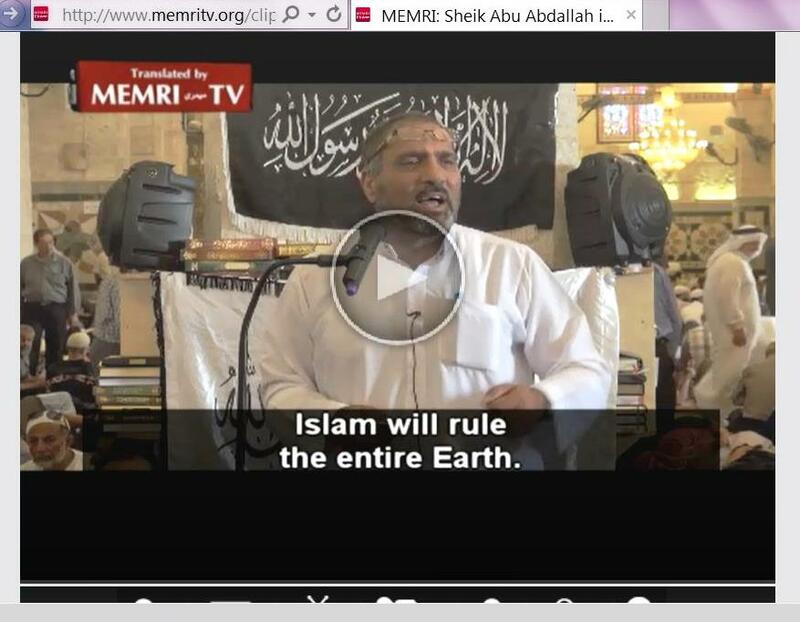 So unfortunately, it seems that some of the building blocks for Germany’s “bridge” to the Islamic world include the downplaying of antisemitism, the recycling of anti-Israel propaganda popular among activists devoted to eliminating the world’s only Jewish state, and even vilifying a German Jewish writer as a fan of supposedly vicious Islam critics and an inspiration to a mass-murdering Muslim-hating far-right extremist. One might wonder if Qantara has perhaps a rather low opinion of the Islamic world or if the site is just trying to cater to its basest instincts? It’s this time of year again when Palestinians and their supporters gear up to use Christianity’s most popular holy day for their own ugly political purposes. Elsewhere it may be the season of goodwill to all, but for the Palestinian Liberation Organization (PLO), it’s just another welcome opportunity to stir up ill will towards Israel and the Jews. 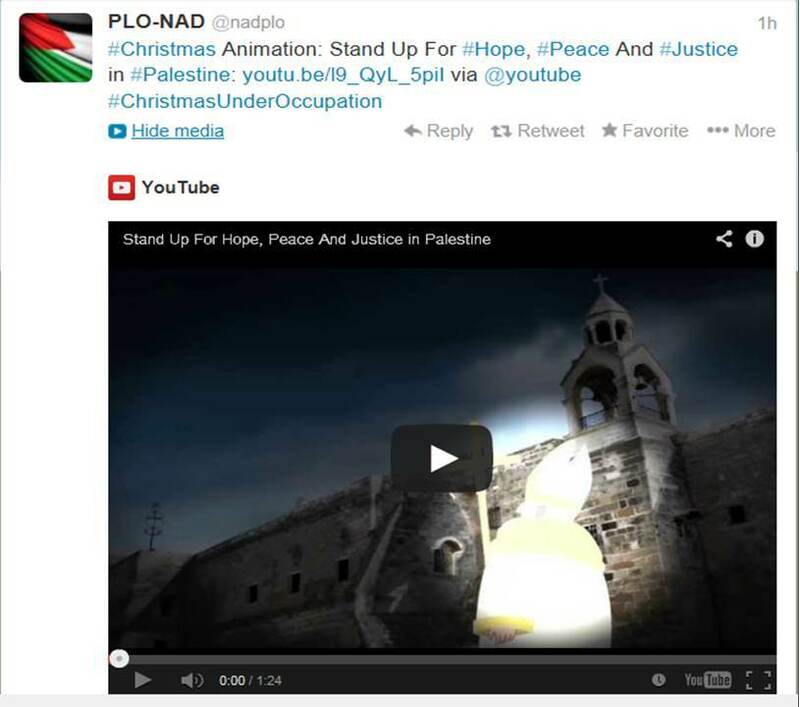 For this purpose, the PLO has just released a short animated clip, which the PLO Negotiations Affairs Department (PLO-NAD) helpfully tweeted with the hashtag #ChristmasUnderOccupation. In this context, it is rather interesting to ponder the popular Palestinian propaganda fantasies about the terrible hardships that would be inflicted by cruel Israeli soldiers on a present-day Joseph and the pregnant Mary on their way from Nazareth to Bethlehem. 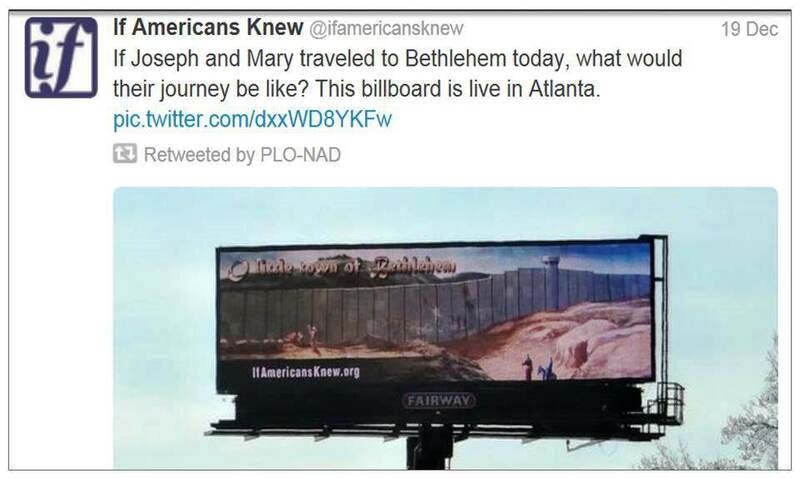 For this Christmas season, the PLO-NAD chose to retweet a tweet by the virulently anti-Israel (not to say antisemitic) website “If Americans knew,” which apparently sponsored a billboard in Atlanta depicting Joseph and Mary being blocked from reaching Bethlehem by the security barrier. Can you imagine what would happen nowadays to a Jew from Nazareth who claims to be of the lineage of David and goes to Bethlehem because he regards it as the “city of David” and therefore his hometown? I’m afraid the best case scenario is that the international media would denounce him and his pregnant wife Mary as extremist settlers who have only themselves to blame if anything happened to them and their newborn baby. And one thing is for sure: if this present-day Joseph tried to buy any property in Palestinian-controlled Bethlehem, any Palestinian willing to sell to him would risk being either lynched or sentenced to death for the crime of selling property to a Jew. Well, as a matter of fact, the “Saturday people” are still clinging to a tiny patch of the Middle East – and Palestinian propagandists work not just on Christmas, but all year round to create the impression that this is what ails the region. First published at my JPost blog.